Memories by AmyInKy: Underclassmen, beware! 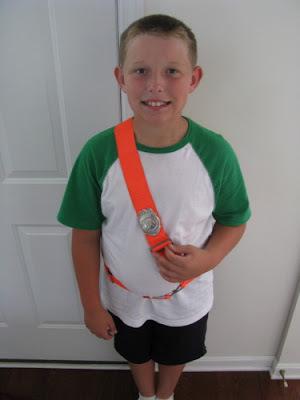 There's a new safety patrol manning the halls at school this year! And look who is one of the officers: Congratulations, Blake! Good luck keeping the kindergarten hall under control each afternoon. We are so proud of you! Very cool! Congrats! Gabe would be great at that job, he's real bossy! omg thats so cute! I just thought that was a tv thing, Ive never been to a school that has that but it will be great thing for him! oh yeah & thanks 4 your comment on my blog. Im doing good just been so busy, Ill try & pop in more at PS!